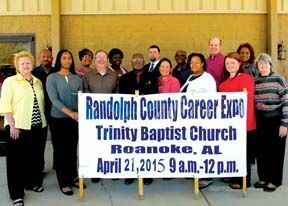 If you are looking for a job prepare your interviewing clothes and your resumes for the 8th annual Randolph County Career Expo. It will be next Tuesday, April 21, from 9 a.m. to noon at the family life center of Trinity Baptist Church, 3501 U.S. Highway 431, Roanoke, across from the Bank of Wedowee Roanoke Branch. Enter through the lower level at the back of the church. The employers coming represent manufacturing, community service organizations, staffing agencies, military and law enforcement. Thirty-one businesses have signed up so far, and usually more sign up in the last few days. The Career Expo is open to the public. It is sponsored by The Randolph County JOBS Task Force and Randolph County Economic Development Authority. Some employers interview on the spot so come dressed for success, with a resume, if at all possible. If you need help preparing a resume you can go to the Alabama Career Center on U.S. Highway 431 or to Annie L. Awbrey Library next to the Handley High School campus. "We would be happy to assist anyone in the county looking for a job who needs help preparing a resume," said Margaret Calhoun, library director. They can walk you through the program on building your resume and there is no charge. The library is open 9 a.m. to 5 p.m. Monday through Friday and Saturday 9 a.m. until noon. She suggested job seekers bring an outline of where they worked, what dates, and the telephone number of the business. The Randolph County JOBS Task Force held a planning meeting Wednesday, April 8. Acting secretary Amanda Nichols said they need volunteers to set up on Monday, April 20. Tamara Thomas, employed at Roanoke City Schools, said she could get several high school boys to help with the setup. Dorothy Tidwell said she and Mary Ammons would take care of providing pastries such as doughnuts and muffins, water and coffee. They will also prepare the bags for sandwiches. Tamiya Lane will pick up the sandwiches from WM Grocery. Fred Williams will get soft drinks. Tidwell said they need to know by Friday how many have signed up so the count can be given to W.M. Grocery. Employers should park in the spaces in front of the family life center. They will start bringing in their presentations and setting up about 8 a.m. Volunteers need to be there by 7:45 or 8 a.m. Applicants should park more to the side of the building. Cotina Terry said the first Ready to Work Class has been completed. This is part of the effort to provide a work-ready community for a business or industry. The six-week course meets on Monday, Tuesday and Thursday mornings in the office adjacent to the RCEDA. The program provides individuals with the education and job skills necessary for employment. It covers topics such as communication skills, computer skills, problem solving, workplace behavior, manufacturing and job acquisition. She said a lab would provide help with professional resumes. Marian Royston is conducting the second session. General Educational Development Diploma or GED classes will also be held on Monday, Tuesday and Thursday afternoons. Terry said 30 percent of the people in Randolph County do not have a diploma or a GED. The next Task Force meeting is scheduled for May 13 at 12:30 p.m. at the Randolph-Roanoke Career-Technology Center in Wedowee. For more information contact Tamiya Lane at 256-357-3053 or Amanda Nichols at 256-357-3018.